"Still rockin', writing and singing. John D. LeVan is a pioneer in rock and roll music beginning way back in the "Fifties." John D. was inducted into the Rockabilly Hall of Fame on August 17th of 2004. He is an award winning singer/songwriter and guitar player who has previously worked with such great as: Roy Orbison, Charlie Daniels, Tommy Overstreet, Sonny West and many others. 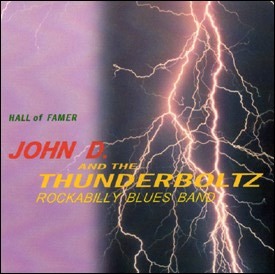 John D. and his band, The Thunderboltz, are still active and can be reached for bookings or to purchase this CD, by going to mailto:asharpmusic123@juno.com or through John's web site in the Rockabilly Hall of Fame. John D. LeVan's recording label is Dejavu Records and he can be reached thru the above e-mail address.